Dry buffer powders provide indefinite or long shelf life, stability and are ideal for low volume use. It's lightweight, inexpensive and takes up very little space. Each sachet is ready to mix with 250ml water and available to prepare on-site. 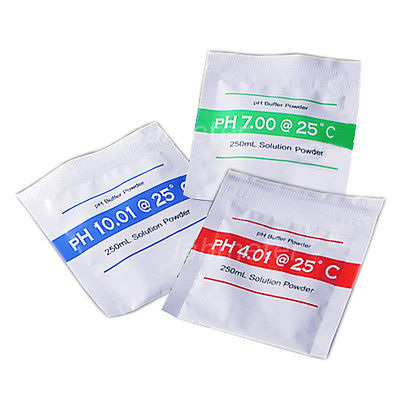 Sachets are available for pH 4.01, pH 7 pH 10.01 buffers standards. These buffers are accurate to within ±0.01pH units @ 25°C and remain stable over long periods of time. Standard packaging is shown below. Put into solution only what you need, when you need it. For optimal performance, re-calibrate your pH meters on a regular basis. A reliable and dependable addition to your pH meters. Combining top-notch and uncompromising quality with an affordable price!